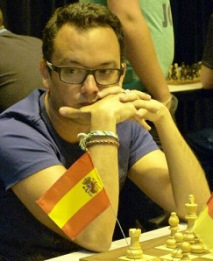 Active chess player, with many years of coaching experience, my training plan is especially focused on improving your openings and the middle game motifs that normally emerge from them. Moreover, I provide deep analysis of your own games. I believe that one of the keys to improve your play is recognizing your own mistakes and your tendency to repeat them in certain positions. My students also benefit from my own new chess experience, keeping therefore up to date with theory and fresh analysis all the time. After you make the payment IM Castellanos will contact you to discuss schedule, training materials, etc. The lessons are conducted via Skype and FICS, ICC or any other chess interface. Make sure to enter a valid email address during checkout. If you have any questions feel free to contact us. If for some reason you are not 100% satisfied with your lesson, let us know no later than 24 hours after the lesson is completed and we will refund your money!